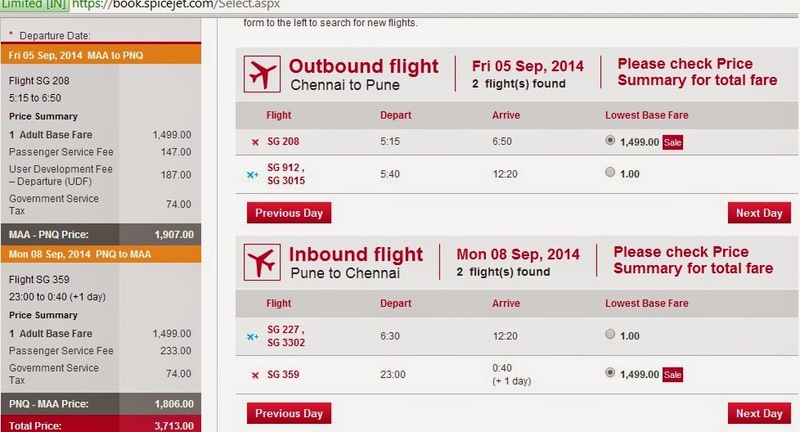 At that point I wasn't aware of spicejet's just launched offer, with base fares of Rs 1. I made a status update on fb an twitter about this ultra low fares and then went to office. In my hurry to leave for office it didn't strike me at that moment that I could try and book such fare for few other destinations. Within hours the news of ultra low fares spread like wildfire and the speicejet website stopped functioning. However websites like Makemytrip and cleartrip were working. By afternoon TOI published an article which helped fan the fire. 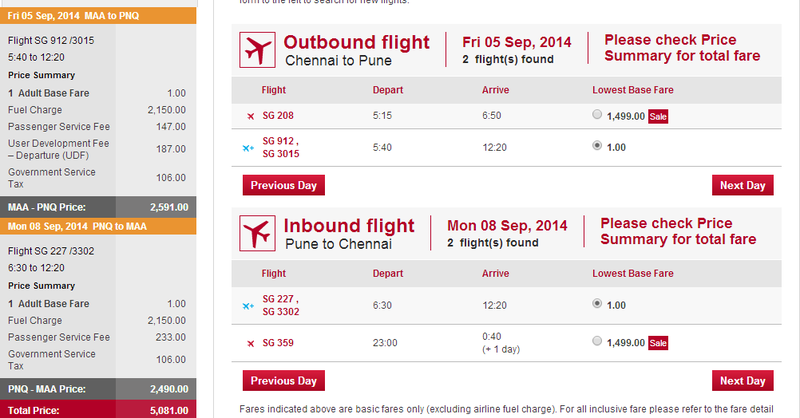 Evening I checked again, tried booking some tickets to Pune, but missed the ultra low Rs 361 option by just a few mins. Still next best deal was about Rs 1200 per person one way or Rs 2400, which is same as KSRTC AC bus fare between 2 cities. So booked one more set. Only 2 seats per flight were offered at such low fares of Rs 370, after which next few seats are offered at about Rs 700-900 range and some more at Rs 1200-1400 price range, all of which are very tempting and much cheaper or at par with alternate modes of transport-such as buses and trains. But it is little tricky to get the right offer on right date that is convenient and practical. Need to book several months in advance as well. Airlines occasionally enter into this kind of pricing to stimulate the market. Also offer is only for select domestic sectors and not for international ones. For sectors involving a transit, the offer was't really cost effective. While I was booking, noticed that lowest base fare doesn't necessarily mean lowest overall fare.Notice in screenshot below- Rs 1 base fare results in higher fuel surcharge and overall cost of Rs 5081 +100 Rs convenience fee, while Rs 1499 fare is 1400 Rs cheaper overall. On some sectors Rs 1 base fare was a total joke- For example, Chennai-Delhi attracts Rs 3200 in fuel surcharge on top of Rs 1 base fare. Anyhow, news this morning is that DGCA has asked spicejet to stop the offer immediately. So other airlines are not likely to follow suit in this price war, much against the hopes of traveling public [Details]. Whoever bagged low price ticket, enjoy your journey, for others, there will be one more time. Whoever thought the sale was an April fool joke would be regretting not booking..